Ticket Street is a Tokyo startup that provides a platform focused on the buying and selling of show tickets. 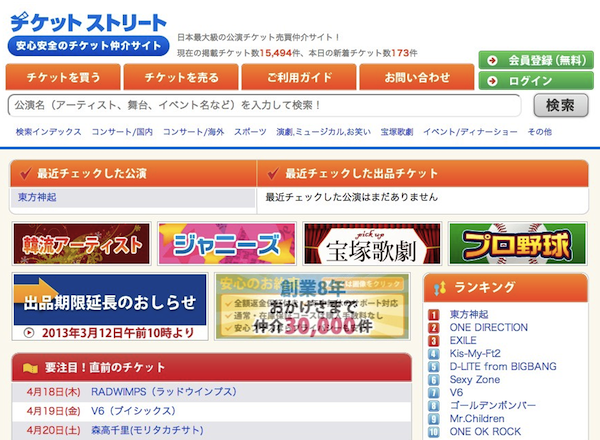 Its monthly transaction value has surpassed 70 million yen (almost $700,000). The startup was originally launched by a freelance engineer and was subsequently incorporated in August of 2011. It has acquired over 100,000 members to date and has grown into to a C2C marketplace with more than 5,000 kinds of tickets available at all times. It fundraised 15 million yen (over $150,000) from Incubate Fund in 2012, and 60 million yen from Mitsubishi UFJ Capital and Mizuho Capital in March of this year. We spoke with the startup’s co-founder and chairman Kei Nishiyama, who explained five key points about finding a new market like this one as well as how to create a value proposition for users. Nishiyama: In terms of the volume of C2C transactions, the biggest market opportunity can be seen in web-based community services. But in these niche markets, if you create a service that allows users to buy securely, without worry of possible fraud, it might be a great business chance. People have always wanted to resell unneeded concert tickets, and C2C deals frequently appear on auction or community sites. The success of our business depends on how much we can identify these needs and incorporate the solutions into our service. Nishiyama: In the Japanese entertainment or live show market, more than 70 million tickets are traded a year. Only 3% of the entire volume are considered to be second-hand sales. But a recent survey showed 6% of people would like to resell their unwanted tickets to someone else. So we can deduce that the other 3% are people are who are trading their tickets face to face. By providing a safe platform that might fit the C2C market needs for an appropriate commission fee to users, we can create a very sound and widely proven ticket resale market. Nishiyama: Typical C2C platforms will not broker trades between a seller and a buyer. However, as a value proposition for their customers, Ticket Street gets in between the two sides as a middleman. For a ticket buyer, if you complete the payment but have not receive a ticket, we (Ticket Street) will try to get your money back from the seller. To secure the delivery of tickets, we’re requesting sellers to use registered mail and enter a tracking number that allows buyers to easily check shipping status. These optional services cost a lot but help our sales. It’s proving that our customers prefer a sense of security when buying. Nishiyama: In early 2000s, the entertainment industry tolerated a loss in the concert business, primarily because it was an important part of promotional activities in selling CD albums. But everything has changed during the last five years. Today, there’s no good news even in the ring tone business. So the concert business is forced to monetize more. For example, if we look at Lady Gaga, after she had a live performance, it subsequently aired on a pay tv channel to make more money. We must not miss recent changes in market trends like this. Nishiyama: Some people think a C2C platform for the second-hand business could not penetrate the mainstream. However, it’s encouraging that an e-commerce giant like eBay can provide ticket reselling services through StubHub, a company they previously acquired. When you have a chance to buy a ticket for a concert, for example, taking place six months from now, you may hesitate to buy because you could have to work overtime or have a critical appointment on that day. But with an easy-to-access second-hand platform, you won’t hesitate to buy, because if you need to cancel your ticket, you can sell it to someone else with ease. By adding such options for consumers, they won’t think twice about buying the tickets in the first place. 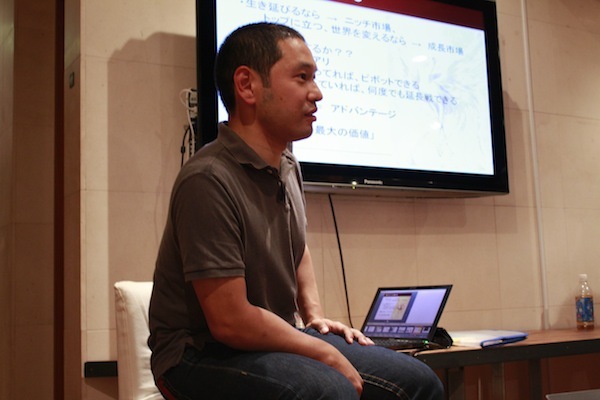 Mr. Nishiyama started his career as an entrepreneur while in university, and he has been working in the startup community for more than ten years. In Japan, there has been a lot of buzz lately around C2C businesses, including notable startups like Base, Stores.jp, or flea-market smartphone app Fril. This is not only about merchandising either, but also we’ve seen many many C2C startups selling intangible things, like private coaching service Cyta.jp. Up-and-coming mobile payments startup Coiney is exploring business opportunities in C2C payment needs. Most likely the increasingly high penetration of smartphone devices and developments payment methods are helping such businesses grow further and faster.